How Important is a Good Backpack REALLY? The first time I hiked the Appalachian Trail, I started in my home state of Pennsylvania. The plan was to start in April and join friends at their summer cabin in Maine during the month of July. Anyone familiar with the state of PA knows that March and April are a tumultuous time where any sort of weather is game. The first week out, we got over a foot of snow! Needless to say, we were not able to continue on our plan as intended ( we haven’t got any crampons ). Determined to keep going, we took a Greyhound to Georgia and decided to hike the Southern leg first. I begin with a ridiculous story about my first hike because it’s important to realize the need for versatile travel gear. Literally, anything can happen out on the trail, so it’s important to be prepared. I’m a pretty organized person, and I like to compartmentalize all my hiking gear so that it fits well and is comfortable for long or multiple day hikes. Anyone who has talked to novice hikers cites their first mistake is in being unprepared in organizing equipment or under packing. Trespass has a great list of common mistakes that highlight the dangers of packing too much or too little. Make sure you do your research about what to pack and how to pack it ahead of your trail hike. You might be surprised at what you do and do not need. 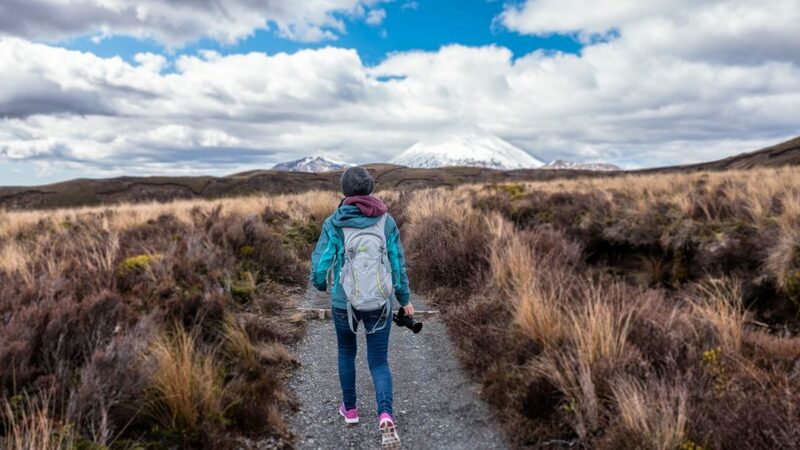 Whether you’re an expert or a novice, you can benefit from reading on for the best hiking backpack under $100. REI has great resources for choosing a pack as well as choosing what goes in it, all based on the length of the hike you are planning. Essentially, buying the right pack breaks down into three categories: backpack capacity, backpack features, and backpack fit. The size pack you need is tied to how long you plan to hike and how much weight you are able/want to carry. Generally, there are weekend packs for one to three days, multi-day packs for three to five days, and extended trip packs for 7+ days on the trail. It’s important not to try to cram five nights of gear into a weekender bag–you’ll cause damage to the bag, invariably leave something out, or under pack to make it all fit. Just as important to your comfort is knowing what features will make your life easier. As with anything else, the more impressive the features, the more expensive the pack. It’s not impossible, however, to get a decent pack with lots of great features at a good price. It’s also important to take into consideration where you’re hiking and what time of year. Some people favor ultralight packs with no frames to hike fast and without a lot of bulk while other outdoor enthusiasts want an external frame pack for lugging a kayak to the lake. All the packs we looked at for under $100 have no frame or an internal frame for hiking. If you’re interested in looking at external frame packs, check out this video from Richard Blair below. Just as important as frames are the ventilation on packs. If you’re hiking in Georgia in June, you want a lighter weight back with good ventilation versus hiking in Maine in December. Internal frame packs ride against your back and can cause serious sweat issues. Many companies are now using the same materials used in trampolines to prevent packs from causing too much sweat. There are lots of other features available in standard packs–you just have to decide which ones are important to you. Usually, it’s highly individualized, but there are benefits to each feature. For starters, I need a pack with lots of pockets so I can keep my clothing, food, and water supplies separate. If you’re a serious hiker interested in moths of hiking, you might want to invest in a pack that has a built-in sleeper. I don’t typically need lots of tool loops, but those hiking in winter climates accompanied by skis may find them helpful. A rain cover is a must for me after hiking PA in April snow, but more arid climates may not find it necessary. I do recommend a pack with a hydration reservoir for a camelback. Usually sold separately, it’s well worth the investment to carry extra water. Of course, it’s crucial to have a good pack to hold all of your necessary items. It’s not impossible to get a good pack at a decent price, you just have to do your research. Luckily, I’ve done a lot of it for you! The Outdoor Master Hiking Backpack is a decent price at around $36 but expects less breath-ability on hot hikes as well as a lower quality fabric choice and lack of structural support. Overall, a perfectly reasonable choice for someone looking to go on day hikes or to use a pack to travel. Not recommended for long hikes or for those in warmer climates. This is definitely one of the best hiking backpacks under $100 on the market. I’m a big fan of Amazon Basics for lots of items in my home and was surprised to see their pack at a cool $56. The rainfly would have saved me in wet weather for sure and this pack is a great value for what you get. This pack is better for those who are interested in overnight trips and would be suited to a week-long trip if you pack tight. The pack is much larger than it appears on Amazon and was a good fit for a bigger person. I wouldn’t take it on a cold trip because the pack struggles with any load over 50 pounds and you would just need too much equipment in bad weather. If you’re just getting started and don’t want to spend a lot of money on a pack, the Venture Pal is the pack for you. At $21, it’s the second cheapest pack on the list. The quality is decent, but I wouldn’t use it for anything longer than a day trip. It does have a lifetime warranty, but most consumers cite it’s difficult to register and comes with lots of strings attached. My favorite part of ordering this pack was deciding what color to get it in–lots of choices if that’s important to you! If you’re ready to step up your game into longer, more difficult excursions, I’d recommend the Titan At $69, it’s on the pricier side but features a rain fly and a structured frame for additional support. The compartments are huge and have plenty of room for a pup tent, sleeping bag, and lots of drinking water. One thing I love about this pack is that you can fill it to the brim without wear and tear on the fabric and seams. For sure a favorite for long trips or difficult terrain. Finally, the best value for the money is the New Outlander pack at $12.99 on the cheapest side, you can get a quality day hiking pack for less than an elementary school student’s backpack. It holds much more than it looks like it would, and comes in a variety of colors. Again, my only critique here is that it’s really only meant for day hikes–no way you’re getting a bag and food in here as well as any necessary first aid supplies you may need. While it’s tempting to buy the first pack that pops up on Amazon, do your research and figure out what is going to be a good fit for you. I can’t stress enough the importance of being well prepared when hitting the trail whether it’s for an hour-long hike at your nearest park or for several month trips hiking the Appalachian. By the way, your dog can also have his own pack for hiking. Check here the best options which you can buy. 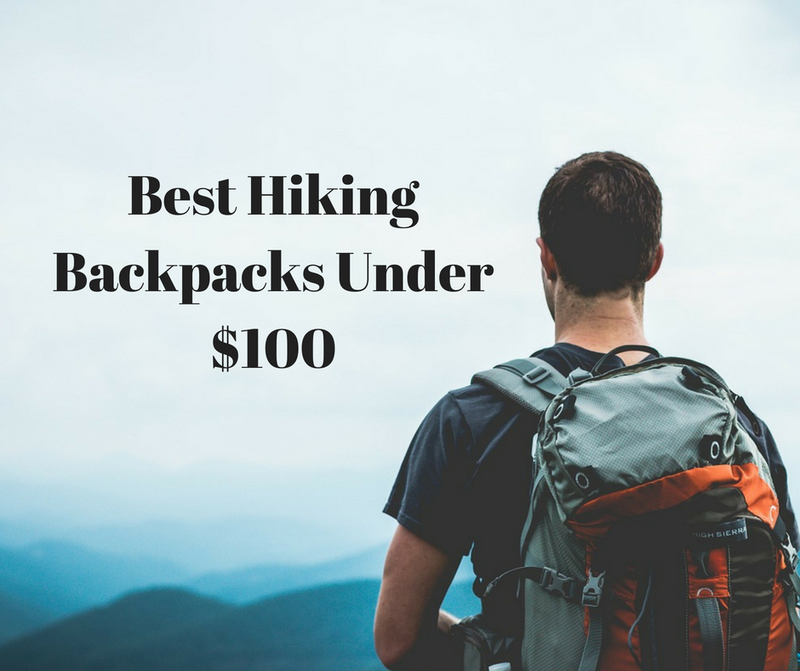 I hope you were able to find the best hiking backpack under $100. Know what equipment you need and what emergency provisions will be helpful so you can have a safe, successful hike every time. Also, check our recommendations for the best trekking poles under $100.